A concept and maintenance of the informative providing of operatively-search prognostication are exposed in the article. The features of the informative providing of operatively-search prognostication are certain in counteraction to the crimes in the field of appeal of narcotic facilities. Basic factors are outlined that influence on the process of operatively-search prognostication in counteraction to the crimes in the field of appeal of narcotic facilities. 1. Mizhnarodna policejska encyklopedija: u 10 t. [International Police Encyclopedia: in 10 Vol.]. vidp. red. V. V. Kovalenko. Je. M. Moisjejev. V. Ja. Tacij. Ju. S. Shemshuchenko. T. 6. Operatyvno-rozshukova dijalnist policii (milicii). Kyiv. Atika Publ. 2010. 1128 p.
2. Afanasjev K.K. Organizacijno-pravovi formy vzajemodii milicii gromadskoi bezpeky z operatyvnymy pidrozdilamy OVS Ukrai’ny. navch. posibnyk [The organizational forms of interaction with the public security police operational units ATS Ukraine]. K. K. Afanasjev, V. V. Gostjev. Lugansk. LAVS Publ. 2005. 198 p.
3. 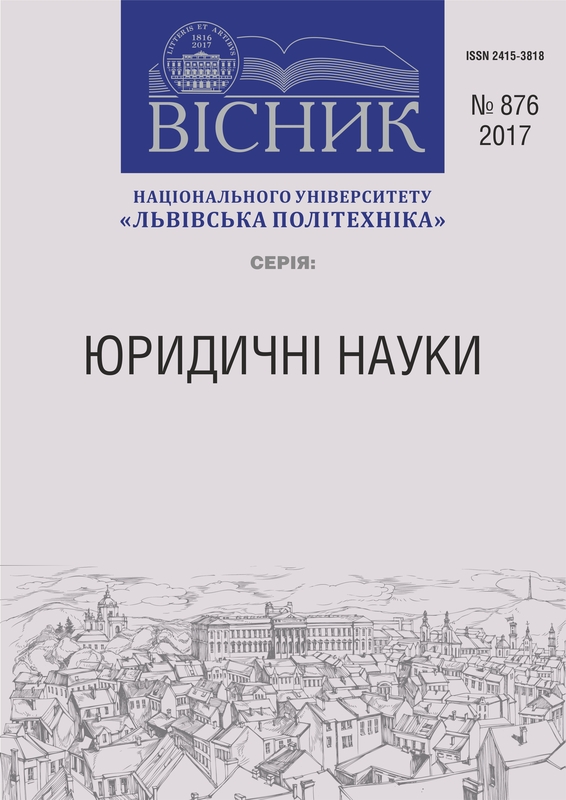 Ortynskyj V. L. Struktura ta infrastruktura orhanizovanoyi ekonomichnoyi zlochynnosti: operatyvno-rozshukova kharakterystyka [The structure and infrastructure of organized economic crime, operational search characteristics]. Odeskyj instytut vnutrishnih sprav Publ. 2004. Vol. 1. pp. 45–55. 4. Kratkyj slovar ynostrannyh slov [Short dictionary of foreign words]. Pod. red. S. M. Lokshynoj. Moskva. Delo Publ. 1976. 420 p.
5. Osnovy borby s organyzovannoj prestupnostju [Fundamentals of the fight against organized crime]. Pod red. V. S. Ovchynskogo, V. E. Emynova, N. P. Jablokova. Moskva. YNFRA-M Publ. 1996. 468 p.
6. Zhuravel V. A. Problemy teorii ta metodologii kryminalistychnogo prognozuvannja [The problems of theory and methodology of criminality prediction]. Harkiv. Pravo Publ. 1999. 140 p.
7. Ovchynskyj S. S. Prognosticheskie osnovy operativno-rozysknoi taktiki. Operativno-rozysknaya deyatel’nost’ [Prognostic bases of operational-search tactics. Operational-search activity]. Uchebnyk pod red. K. K .Gorjaynova, V. S. Ovchynskogo, A. Ju. Shumylova. Moskva. YNFRA Publ. 2002. pp. 702–721. 8. Veroyatnostnoe prognozirovanie deyatel’nosti cheloveka [Probabilistic prediction of human activity]. Moskva. Nauka Publ. 1977. 420 p.
9. Nykyforchuk D. J. Dokumental’ne oformlennya zaminy narkotychnykh zasobiv na lehal’nyy vantazh pid chas zdiysnennya yikh kontrol’noho provadzhennya [Documentation zamyny the legal narcotics shipment during the proceedings of control]. Kyiv. Naukovyj visnyk Kyivskogonacio nalnogo universytetu vnutrishnih sprav Publ. 2007. Vol. 3. pp.14–18. 10. Nykyforchuk D. J. Mizhnarodnyy narkobiznes ta yoho vplyv na kryminal’nu sytuatsiyu v Ukrayini [International drug trafficking and its impact on the situation in Ukraine]. Kyiv. Mizh. naukovo-dosl. centr z problem borot’by z org. Zlochynnistju i korupcijeju Publ. 2005. pp. 71–77. 11. Nykyforchuk D. J. Deyaki aspekty borot’by z orhanizovanoyu zlochynnistyu. D. J. Nykyforchuk, O. M. Snicar, V. O. Zhuk [Some aspects of the fight against organized crime]. Kyiv. Naukovyj visnyk Nacionalnoi akademii vnutrishnih sprav Ukrainy Publ. 2003. Vol. 2. pp. 19–24. 12. Postika I. V. Operatyvno-rozshukove prohnozuvannya ta operatyvno-analitychnyy poshuk u borot’bi z orhanizovanoyu zlochynnistyu, shcho suprovodzhuyet’sya korumpovanymy zvyazkamy [Search operations and operational forecasting and analytical search in the fight against organized crime, accompanied by corrupt ties]. I. V. Postika, L. I. Arkusha. Teoriya operatyvno-sluzhbovoyi diyal’nosti pravookhoronnykh orhaniv Ukryiny. Naukove vydannja. Zagol. red. prof. Regulskogo. Lviv. Lviskyj instytut vnutrishnih sprav pry NAVS Ukrainy Publ. 2000. pp. 218–224.